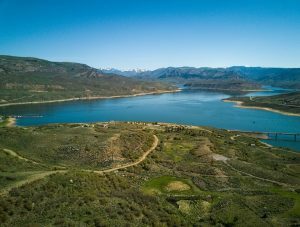 Each of the accommodations envelope you with gorgeous views of Blue Mesa Reservoir and the surrounding Rocky Mountains of Gunnison, Colorado. Ten of our RV sites are pull through and face the reservoir or mesa. They’re 25 feet wide, ranging in length from 80 to 100 feet. The four to six person, one bedroom cabins, and tent sites, each overlook the reservoir. The reservoir boasts some of the best trout and salmon fishing in Colorado, and Blue Mesa Outpost is located just one mile from boat ramps. Located at 940 Cove Road, Gunnison, Colorado 81230, just 25 miles west of downtown Gunnison, and 35 miles east of Montrose, off Highway 50, between mile markers 131 and 132. Enjoy a video of Blue Mesa Outpost, where you can tent camp, bring your RV, or rent a vacation cabin. Such a wonderful view of Blue Mesa Reservoir, near Gunnison CO.